Some recipes we choose to do for less logical, more emotional reasons. Even in the early stages of recipe planning, we were determined to focus on poffertjes for our deep dive into Dutch dining. Nevermind their ubiquity in Dutch snacking culture. Poffertjes hold a bit of sentimental value for the both of us. We can both hearken back to our first experiences in time spent in the land of clogs, windmills and tulips. And even if just for a few days, we were able to do just that. To be fair, our hand might have been a little forced in choosing poffertjes over other typically Dutch dishes. Dutch food – particularly to the Dutch contingent of Cyrus’s family – is not particularly renowned as a dazzling or overly sophisticated cuisine. Try typing in “Dutch food” into a YouTube search bar, for example, and you might end up watching a satiric, relatively unflattering (though very funny) video like this one. Nevertheless, there are some gems in the simple, homely Dutch cuisine. Broodjes haring are certifiably addicting, and both bitterballen and kroketten go famously with an afternoon libation. You can never have too many variations of stamppot, and some of them are actually pretty good. End the meal with some stroopwafel (or speculaas around the Sinterklaas time of year), and you go to bed happy. And of course, there’s also the puffed up silver dollar fluffy lekkernij treat, otherwise known as poffertjes. 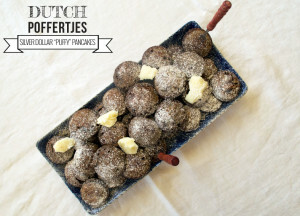 But Are Poffertjes Actually Dutch? Interestingly, this quintessential Dutch snack might not have started out as Dutch at all. Depending on who you ask, one prevailing theory concerning poffertjes lineage maintains a humble beginning in French monasteries during the late 18th century. On the heels of the French Revolution and subsequent Napoleonic wars, there was a crippling shortage of wheat flour – the main ingredient in traditional pancakes – throughout the French homeland. 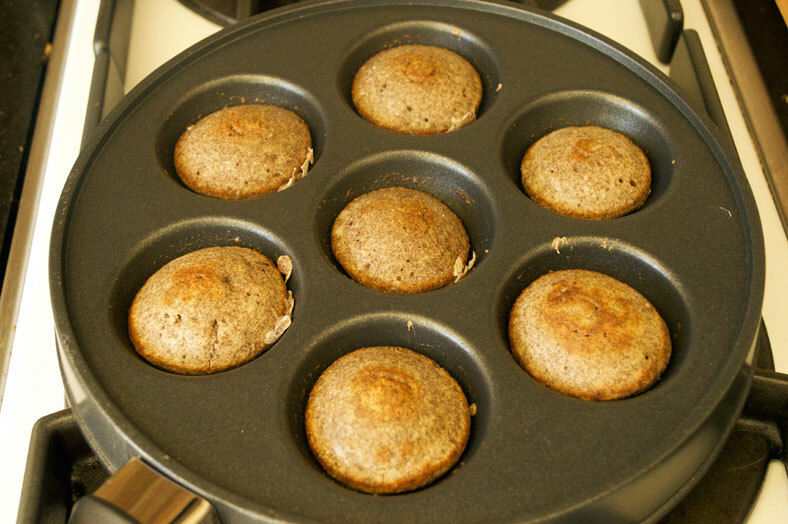 To compensate for the lack of conventional flour, the monks experimented making pancakes – then used as holy bread – with more abundant non-wheat flour ingredients. 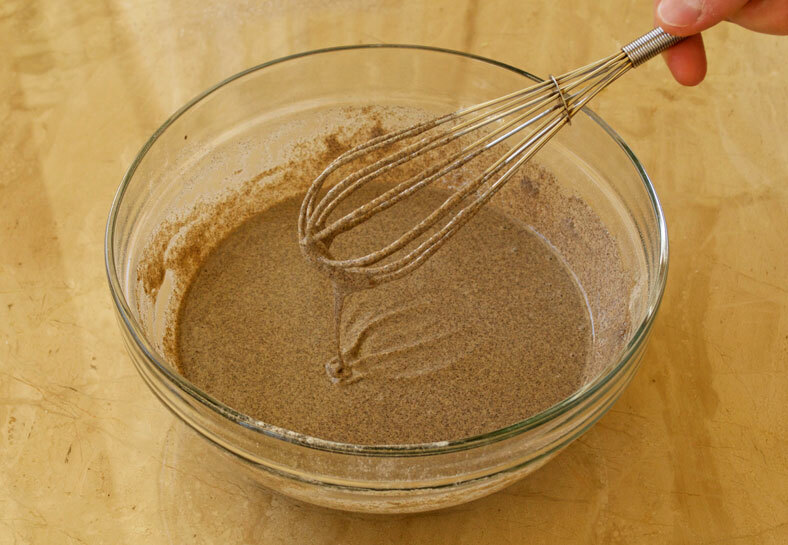 One of the most abundant non-wheat flours buckwheat flour, and while the name might suggest otherwise, buckwheat as neither a cereal nor a grain is unrelated to traditional glutinous wheat. 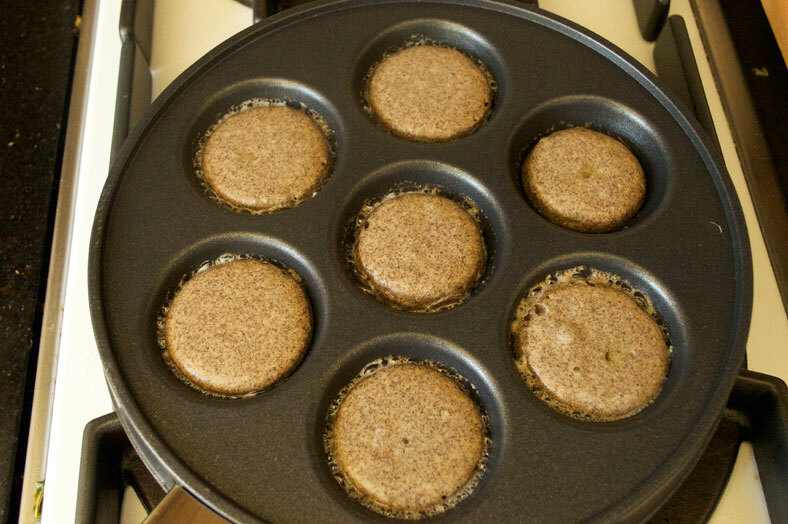 With increased experimentation, the monks developed a recipe for a self-rising pancake combining buckwheat flour, yeast and small portions of wheat flour that soon spread beyond the monastic diet and into the mainstream. The recipe that ultimately became poffertjes made its way into Holland around 1795 with French merchants accompanying the Napoleonic army on an invasion. 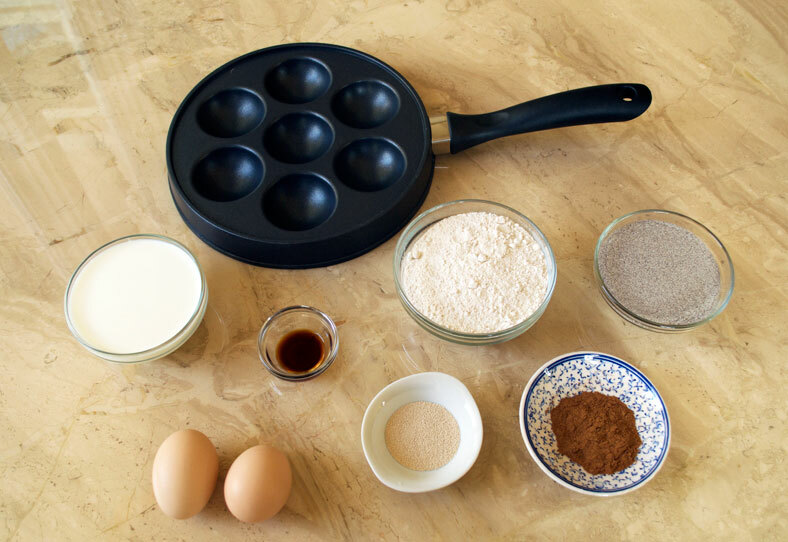 Following that first introduction, the pancake recipe – earlier referred to as broedertjes, or “little brothers” – evolved somewhere between 1815-1820 into the modern day poffertjes, or “little puffs,” and the rest is history. Then again, no traditional recipe really has that clear cut a lineage. For poffertjes, there are several advocates who believe that these silver dollar gems were actually popular in Holland before Napoleon’s time. Food historians have suggested that brodertjes and bollebuisjes, a slightly more puffed up ball-shaped poffertje, had actually been around since at least the early 1700s. Citing old Dutch cookbooks like De Volmaakte Hollandsche Keuken-Meid from 1746 and journal entries, several believe that the poffertje in some way or another already had a strong presence in Holland as early as 1720. Either way, which ever theory proves to be true (if ever), both agree that poffertjes became a certifiable Dutch favorite in the early 1800s, especially at the kermis state fairs and special events. The key to making truly great poffertjes isn’t so much in the batter itself, but the pan being used. As you’ll see in the photos below, poffertjes pans have small dimples wherein you pour your dough (it’s easiest to do with a squirt bottle, by the way). The dough stays neatly in the dimple as the poffertje cooks and rises upward. 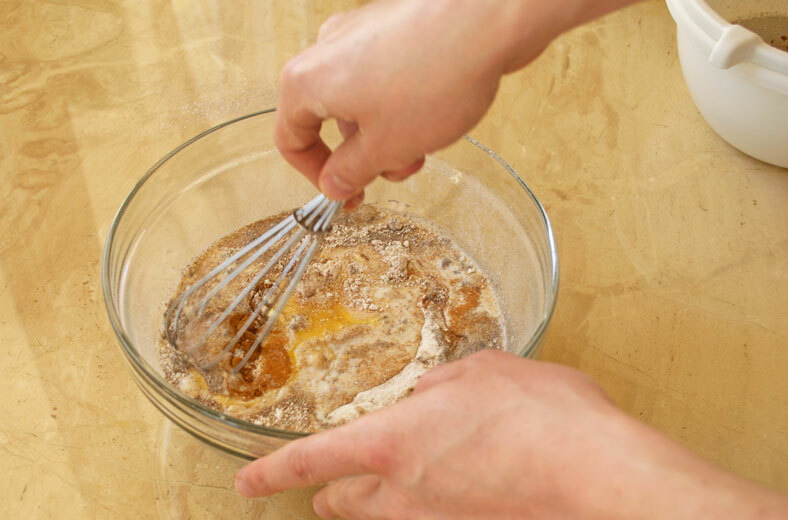 In order to get a good rise, though, you’ll need to still make the proper batter for poffertjes. 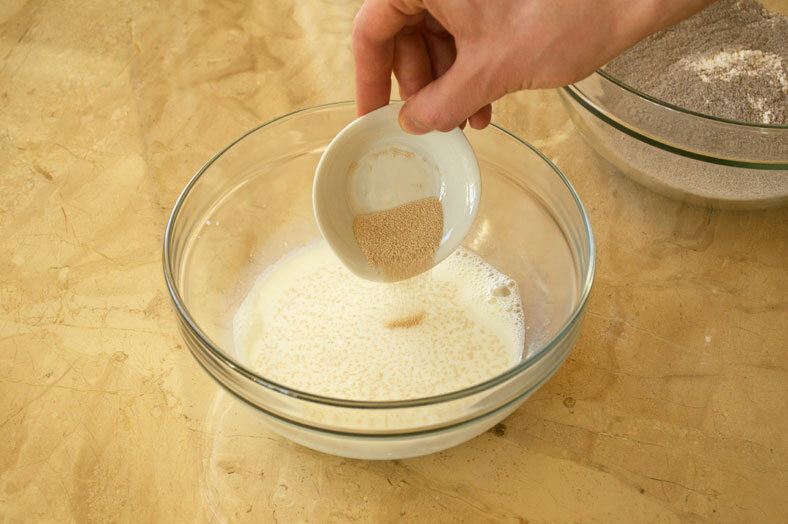 The rising effect will come from yeast, which you’ll first activate and then stir into your dough made from milk, flour and eggs. 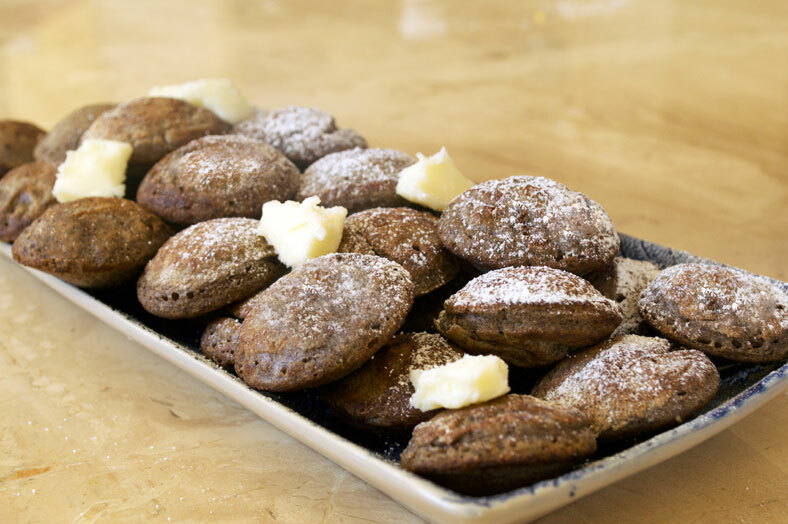 Technically speaking, true poffertjes need to have a combination of both buckwheat and wheat flours, but you could make an all-wheat flour version of the batter if you so choose. As with most pancake batters, you want a slightly runny consistency to the dough especially if you decide to distribute it through a squirt bottle. To use other batters as comparison, you would want your poffertjes batter to be slightly thicker than crepe batter (which needs to be incredibly runny for quick distribution) and definitely runnier than a more robust hotcake batter. 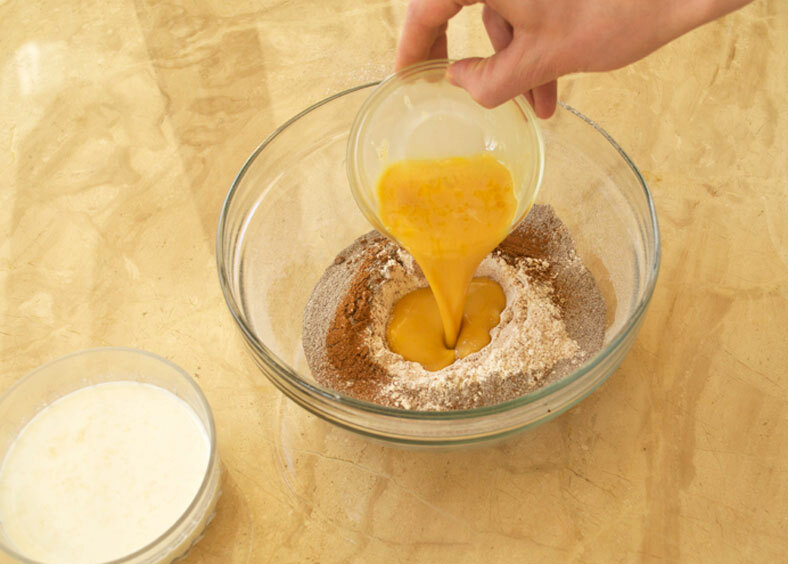 After you’ve created your runny batter, you’ll let the dough sit for at least 45 minutes as the yeast works its magic to give you an airier “more puffable” batter. Once its ready to go, you heat up your pan, add small pieces of butter into each of the dimples, and carefully add enough batter to fill up each dimple halfway. The poffertjes will cook for roughly 2-3 minutes on each side, and you might start to notice the cool effect of having the batter rise vertically. Using a chopstick or the backside of a fork – since you don’t want to puncture the poffertje – you flip it over and let it do the same cooking/rising on the other side. After no more than 4-5 minutes in the dimpled pan, you have a small silver dollar-sized puffed up disc of pancake goodness… otherwise known as the poffertje! Once you have enough to put together on a plate, one of the most common ways you can (and should) enjoy your poffertjes is with a nice heap of butter and some powdered sugar. Your poffertjes will still be hot enough to slightly melt the butter, which then captures enough sugar to ensure delightful, indulgent goodness in every bite you have. Given our personal affinity to poffertjes, we wanted to mimic tradition before making our own health-minded adjustments. For that reason, we did choose the following as our original reference recipe, but more so because of the proportions of ingredients rather than the ingredients themselves. 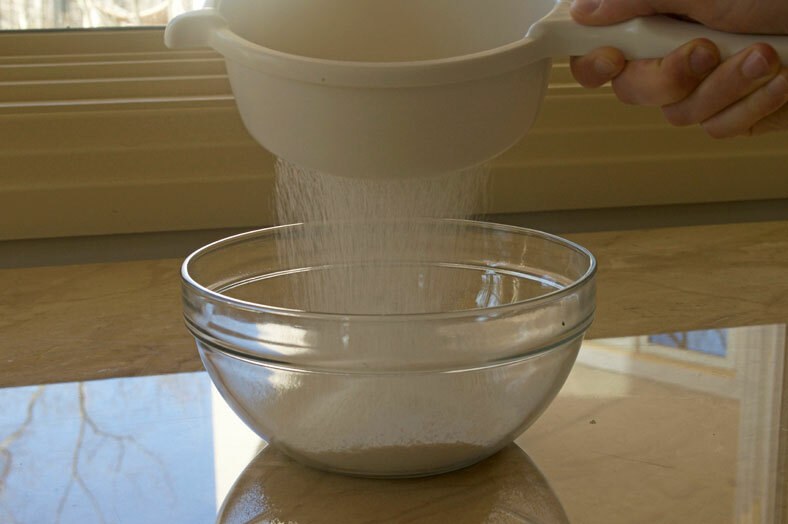 The biggest adjustment we made for our own recipe came in the flour. Instead of everday all-purpose flour (which we almost never use here anyways), we opted for a slightly more nutritious blend of organic pastry flour and buckwheat flour. 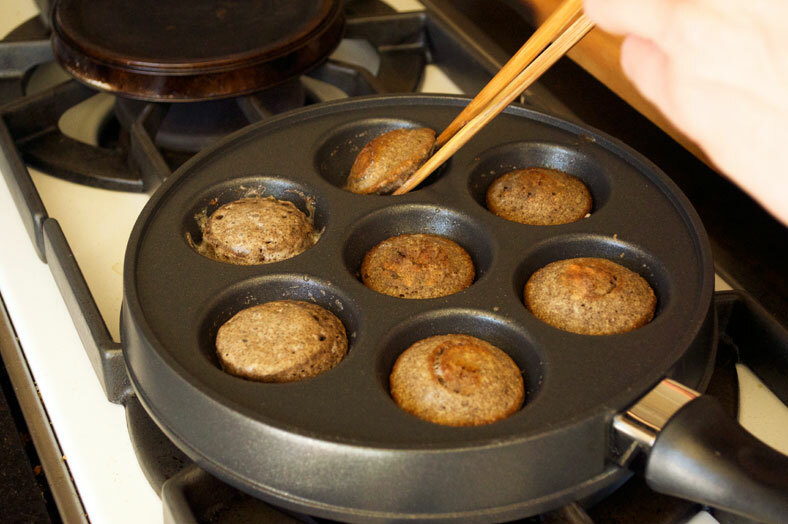 You might be wondering why such an adjustment led to our much darker poffertjes instead of their more commonly whiter color. The reason lies in the buckwheat flour, where the color of the flour depends on how much of the hull has been left in. 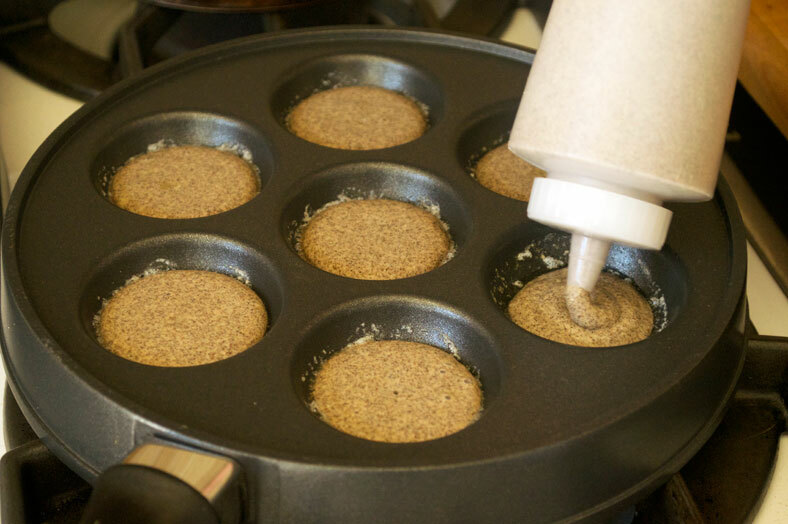 Lighter hulled buckwheat flour is lighter, airier and perceived as a more delicate flour, but it has had highly nutritious fibers removed that the darker, more “rough and tumble” unhulled buckwheat flour still retains. 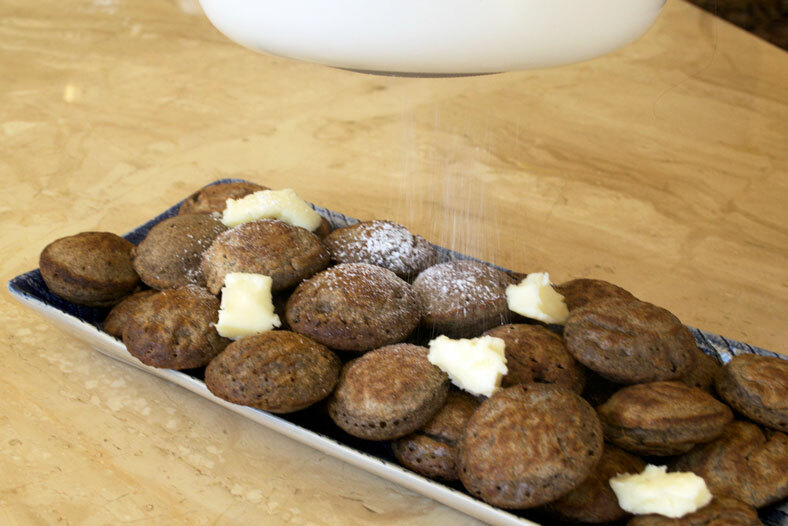 For us, we’d prefer to have a little extra fiber in an already indulgent treat, which is why we went with unhulled buckwheat flour for our recipe. 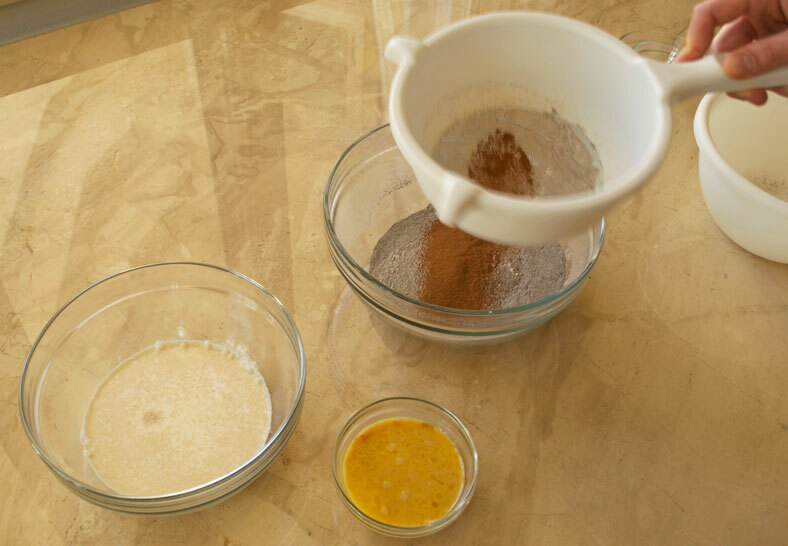 To give the poffertjes some added base taste, we also added ground cinnamon and vanilla extract to the butter. This was a variation that Cyrus had seen a street vendor use before when he lived in Holland, and he liked it enough to make the suggestion. It doesn’t make a huge difference to the base taste, but it’s a nice subtle tweak. Otherwise, there’s very little else you need to do for some truly great poffertjes. It’s not a treat you would want to have every day, but it’s sure to be a fan favorite when you do decide to make it. It was for us, and we can enjoy a nice trip down memory lane each time we make them. What do you put on your poffertjes? Comment below! Take a small saucepot over medium heat and add your milk. You want to heat it to slightly above room temperature but not much more than that. You don't want to kill the yeast! 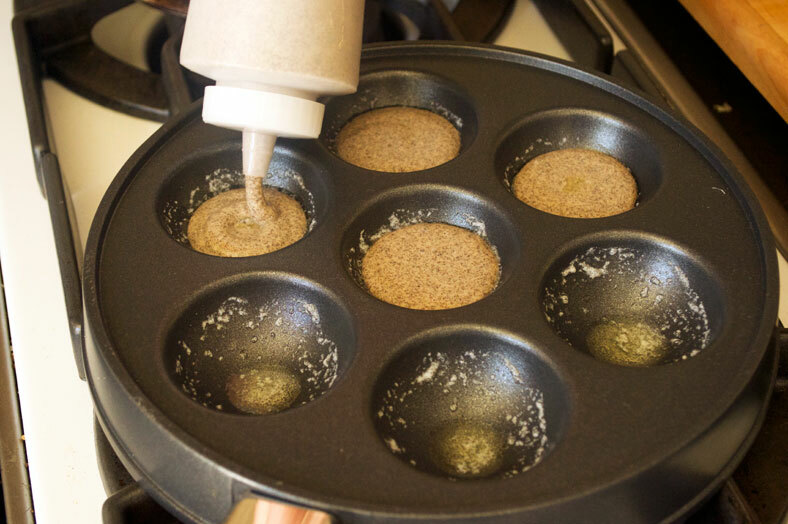 Once heated, pour some of your poffertjes dough into each of the divots, filling them up to about the halfway point. You don't want to go much further than that, otherwise the poffertje will outgrow it's little pocket! Stage 4 - Plating the Poffertjes! To eat poffertjes in the traditional way, spread small pieces of butter over top, then sprinkle confectioner's sugar thereafter. (If you're looking for a slightly healthier option, that's totally fine too.) Enjoy!